You are a teacher, and the school board gives you $500,000. Or you are a construction worker, and your foreman gives you $500,000. Or, you work some other kind of job and your boss gives you $500, 000. Holy Cow! What do you do with all that money? Imagine you are sitting at the feet of Jesus, listening to him tell a parable, and it’s about something called “talents.” This is a word that every 1st century person would have known. The word “talent” did not mean “special gift or ability.” That meaning was attached to the word in the middle ages. When Jesus spoke about talents he was talking about an enormous amount of money. He was talking about something so huge, so valuable, as to be a treasure almost unimaginable for the folks he was addressing. A talent was approximately 15 years’ wages. The basic story is this: in preparation for going on a long journey, a master entrusts each of three slaves with enormous amounts of money—to one 5 talents, to another 2 talents, and to another one talent. The slave with 5 talents receives the equivalent of 75 years’ wages—that’s more than $2 ½ million for our teacher or construction worker. And then the master leaves on his journey. The slave who received 5 talents and the slave who received 2 talents decide to trade with them, which means, they make some kind of investment. There was no stock market. The investment was most likely a loan to someone to start a business. They could have deposited the money in a bank. But as we know, the rate of return on a bank account tends to be low. These two servants doubled the money, so we know it was a risky investment. They risk losing it all! But the third slave, the one who received one talent, equal to15 years of wages, buries it in the backyard. There’s one thing you should know about burying the talent. The people listening to Jesus tell this parable would have thought burying the talent the completely reasonable, responsible thing to do. Just put yourself in the servant’s place. The amount of money was enormous, and the servant had no experience handling that kind of wealth. The only responsible thing to do was to try very hard not to lose it. And so, the servant says to himself, “Don’t take a risk. Don’t get into trouble.” The third slave obeys conventional wisdom. But Jesus had another idea. Jesus had unconventional wisdom in mind. Let me ask you this: have you ever been entrusted with something huge; something that was far beyond your experience and abilities? A responsibility of some sort that filled you with a kind of fear, even as it filled you with excitement? Some jobs come to mind. I imagine being a pilot, flying a plane and being responsible for the lives of hundreds of passengers. Or being a surgeon, having the inside of the human body laid bare, and being responsible for that life. I remember when I became a parent. I had no previous experience, and no idea of how to raise the two children God gave to Nadine and me and that was, and still is, a huge responsibility. Life does call upon us, from time to time, to take on something beyond our previous experience and ability. What do we do when that happens? The listeners of Jesus would have understood Jesus’ point. This master is kind, generous, trusting, responsive, welcoming. Then we have slave #3, and the slave says to the master, “I knew you were a harsh man…so I was afraid, and went and hid your talent in the ground.” (25:24-25) This slave is not describing the master as we know him. This slave sees the master as cruel, harsh, almost—evil. And the shock for Jesus’ audience becomes complete, as the kind and benevolent master calls this slave wicked and lazy, gives his talent to the one with ten, and orders him thrown into the outer darkness, where there is weeping and gnashing of teeth. And so, here’s a question: Why was this one who buried his treasure ‘wrong?’ What did he do that was so terrible that earned him the wrath of his master? One help in interpreting the meaning of this parable is found in its first words: “For it is as if…” (25:14) What is “as if?” If we back up just a little bit in this chapter 25 of Matthew, we can see that Jesus tells another parable, which begins, “Then the kingdom of heaven will be like this” (Matt. 25:1). The “it” is the kingdom.” This parable is about the kingdom of heaven, or the kingdom of God, of the kingdom of Christ…all terms used interchangeably in the gospels. The talents, the many years of wages entrusted to the slaves, is not money, but something far more precious. The talent is the treasure of God’s kingdom breaking into our world through the life, death and resurrection of his Son Jesus, to save us, to rescue us from sin and death, to declare to us that we are children of God – loved, valued, forgiven – and that we have a place and a home with God forever. The Bible calls this message, the gospel. The gospel, the good news of Christ, is the talent that has been entrusted to us. That changes how we look at this third servant. When the treasure is the gospel, then burying it is an act of supreme disobedience toward God. The first two servants, instead of burying the treasure, traded with it. In other words, they took it out into the world and shared it with others. This is the big enchilada. This is the pearl of great price. There is nothing of greater value. The gospel is not something to be buried. It is something to be shared. These wonderful words of life is the treasure that has been entrusted to us. And we have a mission – to share with others this treasure we’ve been given. 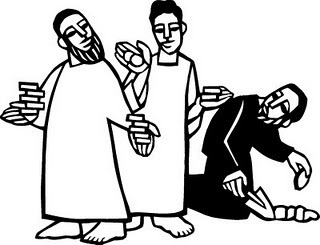 That mission will lead us to all kinds of things: from welcoming and serving and helping people in need, to our involvement in the ministries of St. John church, to the giving of our finances to support the church’s preaching and teaching of this gospel. Friends, Jesus has given us a treasure beyond our imagining, greater wealth than we’ve ever hoped to see in our lifetimes. We are loved, valued, and forgiven. We have an eternal home with God. We are his children forever. Let’s step out of our comfort zone and take a risk by given of ourselves, our time, our abilities, and our finances to make sure this gospel message gets shared with others.